For your vet approved medications and vaccines & drenches. Warrnambool Veterinary understands that any time off-farm for you or your workers costs. The answer is for your veterinary approved medications to be delivered on-farm to you, right where you need it. 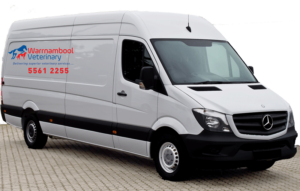 Our delivery van has refrigeration facilities too to ensure your vaccines and other products arrive in the best condition, ready for use. The delivery service is FREE for Warrnambool Veterinary Dairy clients. Monday (West)Koroit, Port Fairy, Toolong, Tarrone, Warrong. Friday (East) Allansford, Mepunga, Naringal and Nullawarre. Call the Large Animal Desk on 5561 7666 by 10 am on the delivery day that matches your location. One of our qualified dairy vets will assess your needs and provide approval for the medications. The purchase will be documented with a copy of the order delivered along with the medications to you on-farm same day. Working with you to improve and expand our services to meet your needs now and into the future.